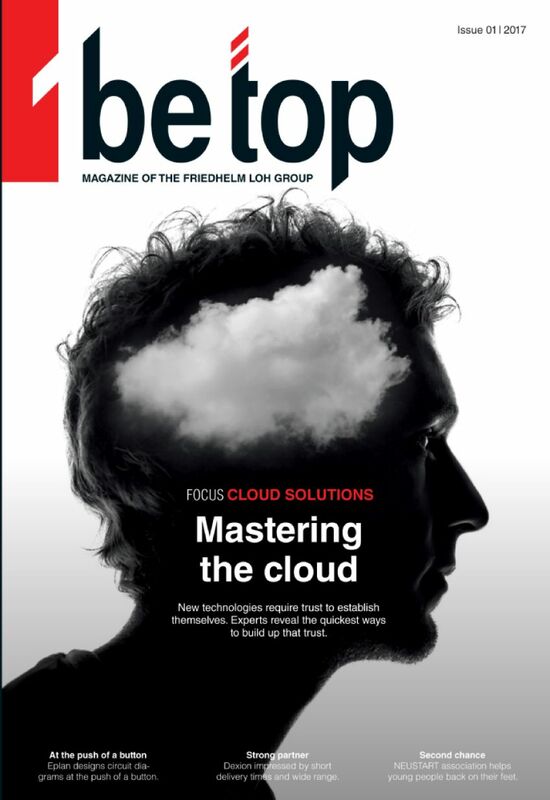 be top magazine: “Mastering the cloud”: How companies build up trust | Rittal - The System. 2017-08-18. Public, private or hybrid cloud: Using the cloud is increasingly becoming a long-term, economic success factor for companies. However, there is one essential requirement – trust. The new edition of “be top” explains why technological progress needs a good measure of trust if it is to thrive. In the Friedhelm Loh Group company magazine, four experts reveal the quickest ways that companies can establish that trust. “New technologies only start to become established when users trust them. No matter how good or beneficial they are, if there is no trust, the technology will only be used by a handful of entrepreneurs,” explains Matthias Söllner, assistant professor of management and business studies at the universities of Kassel and St. Gallen. Prof. Söllner is one of four experts featuring in the latest edition of customer magazine be top. Digitalisation is an everyday reality for them. In be top, they explain why new technologies such as cloud computing need trust and reveal the quickest ways that companies can build that confidence. After all, everyone can agree that trust contributes to sustainable and profitable success. Decisions about whether or not to adopt new technologies such as the cloud often centre on a sense of security. That is why, in his interview, Dr Dirk Schlesinger, Chief Digital Officer at TÜV SÜD, talks about effective precautions and the courage to pursue progress. The Friedhelm Loh Group is in no doubt that this sense of security is essential to building trust. In fact, that proviso is borne out by Europe’s largest data centre project in Måløy, Norway. The 120,000-square-metre Lefdal Mine Datacenter is housed in a former olivine mine that has been equipped to the highest security standards. Thanks to support from partners Lefdal Mine and IBM, it is now home to one of Europe’s most secure, cost-efficient and environmentally friendly data centres. Any company that wants to master the challenges of Industry 4.0 needs dependable partners who have experience and stand for quality. High-level shelving manufacturer Dexion agrees. The company uses thin sheet steel to make stable shelving up to 30 metres high designed to carry loads that weigh tons. To offer its customers short delivery times and a broad range of materials, it relies on steel supplier Stahlo as a strong and trustworthy partner. As be top shows, trust is a valuable commodity that is highly prized in all areas of life, but can also be easily lost. Robi Brömel knows that only too well – after beating his drug addiction he had to learn all over again to have faith in himself and his abilities. NEUSTART, an organisation that looks after vulnerable young people, helped him on his journey. The message in the new edition of be top is clear – without trust there can be no progress or success. Read more in the latest be top 1/2017, which is available to download here.